We’ve been thinking quite a lot about whether we should bring back ICE, and if so, in what form. Based on the forums, most of you would like to have it back too, so we finally decided that the most straightforward thing to do of course is to make it give credits. For those of you not familiar with ICE (now called Instant Credit Extender instead of Integration Cycle Extender, hooray for multipurpose acronyms! ): it’s an item that you can purchase for real money (costs the same as a 2400 credit pack), which gives you an ingame ICE item that can be traded on the market. If you activate it ingame, it gives 2400 credits to your account. The trick is of course that those who don’t want or can’t spend real money on credits but have the NIC to spend can this way obtain credits too. Some of you have also suggested that there should be smaller credit packs too, because sometimes a pack of 2400 credits can be too much if you just want to downgrade a few extensions. So starting today, we’ll also offer tiny packs of 200 Perpetuum Credits. If this is received well and ICE also works out, we’ll consider doing a smaller version of ICE too, providing 200 credits. And not just because then we can have vanilla ICE and ICE (ice) baby. To celebrate the return of ICE and of course the Holidays, we’ll have a Winter sale along with the Steam Holiday sale, where the base game and all credit products (including ICE) will be 33% off. So, let’s start this. I’ll tell you in advance that this will be a big change that not only affects assignments but general gameplay too, so one blog won’t be enough. But we have to begin somewhere. Just to get you up to speed, the second stage of our assignment system revamp is about making the assignments themselves random, meaning that you still choose the type of the assignment, but the exact objectives and locations are generated randomly when you request it. Currently there is a big problem with the number of available assignments at a specific location. Although we have over 500 hand-crafted assignments, this number gets so diluted due to all the terminals, levels, and assignment types, that we are sometimes left with only 4-5 assignments in the final random pool. And that means a lot of repetition. For you, it provides for a varied gameplay experience, providing just an ample amount of uncertainty, without stumbling into the exact same assignments over and over. For us, it frees up a lot of content development power. A properly done template system allows us to simply add a new objective to the pool, and the system will automatically include it in all future assignment assembly requests, exponentially increasing the number of possible assignments. So in the new system, instead of creating specific assignments with specific objectives, we only create assignment template schemes. This means that we only set the type of objectives, like “destroy N number of X type NPC”, not specific NPCs, numbers, or locations. Of course we still have to create a number of different templates for all types of assignments (combat, industrial, transport, etc. ), but this can’t be compared to the man hours we need to create fixed assignments. Due to the generative nature of this template system, we can also easily create relations between the number and difficulty of the tasks that get included in the assignment, and the rewards that you’ll get for them. Naturally, this makes balancing changes a lot easier too: a simple reward multiplier that is based on the request location zone can easily add an additional risk reward for beta assignments, while still using the same templates as alpha islands. Sidenote: There is a certain room for randomness in templates too, but the objectives usually build upon each other and their order must be logical, so that would need a lot of rules which ultimately might not even pay off compared to fixed templates. 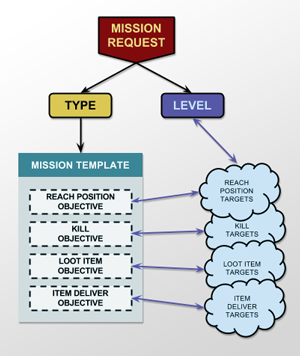 Even with fixed templates there are a lot of pitfalls that we have to address, like linking together loot and dropoff objectives so they provide and request the same random item. Another complaint that keeps popping up about assignments is that the walking time to get to and from an assignment is a lot of times longer that the actual time it takes to complete it. The new system employs a combination of various new mechanics to fight this. 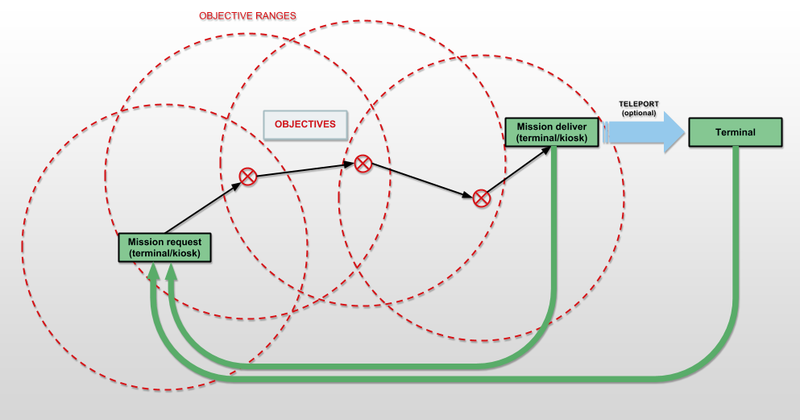 For one, when you request a new assignment, the objectives from the random pool will be picked by considering a distance limit from the request location. 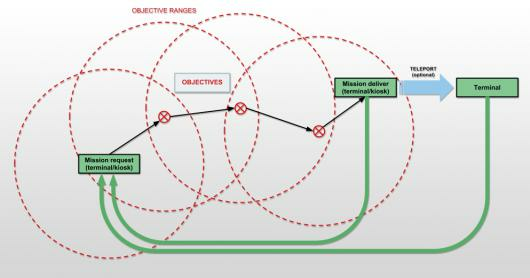 To be more precise, the first objective will consider the distance from the request location, the second objective from the first objective, and so on. Assignments basically become a daisy chain of objective locations that randomly send you around the world, but with reasonable walking times between them. The advantage of these small terminals is that it doesn’t matter if you have wandered too far off from a main terminal, you’ll always have a small assignment terminal nearby where you can request a new assignment, without having to break the action too much. And finally, there is the idea of providing a teleport home option at these assignment terminals. This would be only offered for a fixed time after you completed an assignment, to give you the possibility of loading off your loot at the main terminal or generally finishing an assignment-running session. The above are generally meant to make doing assignments more dynamic, but we also plan to give these terminals more, important roles, and these will affect gameplay in general. They will function as persistent, private storage facilities on the terrain. You can drop anything from your cargo into them and they will keep them indefinitely and securely. Assignments will also use them to provide any starting or reward items. They will also make you able to re-equip your robot while on the terrain, using either modules from their storage or from your cargo. This function will probably have the largest impact on the way you play Perpetuum. So as you can see we have a large part of it worked out, but there are still a few things hanging in the air, mostly related to specific objective types and how they can work together with the template system. NPC spawns in general are also slated for a revamp that would make us able to create real mixed spawns that work together as a single group, and to solve the orange spawn/red spawn/kiting/AI issues, but that’s already for another time. We’re also trying to work out why some of you experience serious lag and disconnects and others not. Unfortunately we’re still tapping in the dark since we can’t reproduce it either, and it’s hard to fix something if you don’t know the cause (assuming that it is a problem with our server). Some internal measurement tools are in the works, which could possibly find their way into the live client as well. On behalf of the Dev team, we wish you Happy Holidays!